Google used to collaborate with smartphone manufacturers for their Nexus devices, but the company is now promoting their own Pixel brand, and has just launched Pixel and Pixel XL smartphones powered by Qualcomm Snapdragon 821 processor, and running Android 7.0 Nougat operating system. Audio – 3.5mm audio jack, single bottom-firing speaker, 3 microphones, noise suppression. The phones will ship with a USB-C 18W adaptor with USB-PD, and A-C cable (USB 3.0), a C-C cable (USB 2.0), a SIM tool, a quick switch adapter, and in box promos and collateral. Pixel phones will run Android 7.0, are compatible with Google’s Daydream VR platform, and include the new improved Google Assistant, successor of “OK Google”. 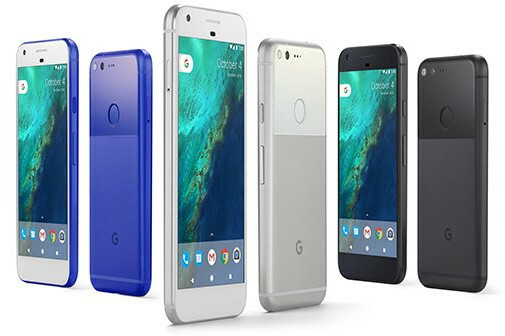 Pixel is available for pre-order for $649 (32GB) $749 (128GB) and Pixel XL for $769 (32GB) $869 (128GB) in the U.S., U.K., Canada, Germany and Australia with pre-orders in India to begin on October 13. More details can be found on Made by Google phone page scheduled to launch in October & November in several countries.